So you or someone you know has just been diagnosed with early signs of macular degeneration. 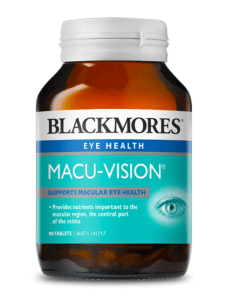 At present there is no cure for macular degeneration, but there are preventative measures one can do to slow down progression to severe macular degeneration and potentially delay vision loss. If you smoke, you are three times more likely to develop macular degeneration and may also develop the disease five to ten years earlier than nonsmokers. If you have a history of macular degeneration in the family and you smoke, you have significantly higher risk of developing wet macular degeneration. You can read more about this when you download our FREE guide on macular degeneration. Studies have shown that a diet rich in antioxidants and zinc lowers the risk of macular degeneration and slows down the progression of the disease. 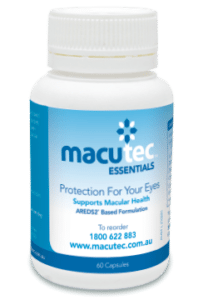 The Age Related Eye Disease Study (AREDS) found that increasing lutein and zeaxanthin in the diet reduced the progression of macular degeneration further. Omega-3 fatty acids also decrease the risk of developing advanced macular degeneration, but increase in the dose of Omega-3 fatty acids did not reduce the progression further. What is Lutein, Zeaxanthin and Omega-3? Lutein and Zeaxanthin are carotenoids, which give plants their vibrant red, orange, yellow and green colour. In plants, lutein and zeaxanthin appear to absorb excess light energy to prevent damage to plants from too much sunlight. Lutein and zeaxanthin have antioxidant properties, and it is believed that they help increase the concentration of pigment at the macula, which is important for filtering dangerous short-wavelength light and reducing the generation of free radicals in the retinal pigment epithelium and choroid. In other words, they provide antioxidant properties for the macula. Now, most people probably have heard of Omega-3 and take fish or krill oil supplements already. But what is it? Omega-3 fatty acids are polyunsaturated fatty acids that are essential for metabolism, normal growth and development. Where can I find Lutein and Zeazanthin? Lutein can be found in cooked kale and cooked spinach and yellow carrot. Zeaxanthin can be found in paprika, corn and saffron. If I don’t eat these vegetables, what supplements can I take? 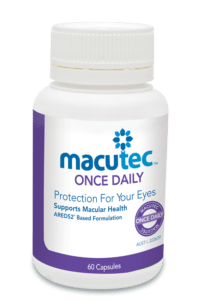 So what is the dose of lutein, zeaxanthin and omega-3 fatty acids that is effective in reducing the risk of progression of macular degeneration according to the AREDS study? Now there are different brands of supplementations available. Some have varying zinc levels, which the study has found to not have significant effect on reducing the risk of progression. 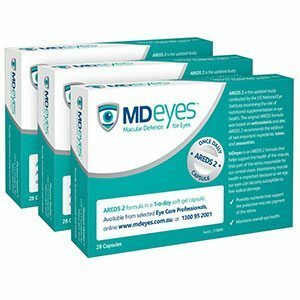 MD Eyes: one tablet a day. Adding Omega-3 to your diet is also important. These can be found in plants sources such as walnut, edible seeds, flaxeed oil and hemp oil. Animal sources of omega-3 include fish, fish and krill oil and certain chicken eggs containing EPA and DHA. The university of Wisconsin looked at the relationship of physical activity and macular degeneration and found that women who exercise had 54% lower odds for early macular degeneration. 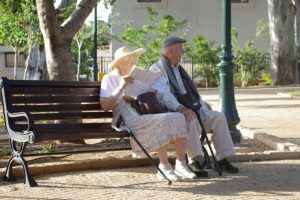 Another study also found that increased walking of more than 12 blocks daily decreased the incidence of exudative AMD by 30% over 15 years. So you don’t need heavy-duty exercise. Start by walking and do it regularly! 4) Know your family history. If you have a close relative with AMD, you have a 50 percent chance of developing the condition. Yes, that is 1 in 2 chances you will develop macular degeneration. 5) Have regular eye tests. Rather than worrying, go see your optometrist and make sure they check your macula not only for one time, but yearly. If you have a family member with macular degeneration, ask them what type of macular degeneration they have and what are the first symptoms they noticed. It is important not to wait until you find a problem with your sight before you present to your optometrist, as early macular degeneration is usually asymptomatic. Are you age 50 and up? Let our optometrist screen your eyes for AMD. Optometrists are experts in vision care who diagnose, manage and treat a wide range of vision problems, eye diseases and ocular conditions. By prescribing spectacles, contact lenses, vision aids and other treatments, optometrists help their patients maximise and retain good vision for life. Say Goodbye to “Normal” Contact Lenses and Glasses and Hello to Ortho-K! Your High Prescription Lenses Don’t Have to Be Coke-Bottle Thick!